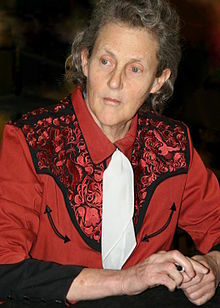 Marie Temple Grandin (December 3, 1947) is an American animal scientist. Grandin grew up in Boston with her parents Richard Grandin and Eustacia Cutler. Her father was a real estate agent. Her mother was a writer, singer, and actress. She was born on August 29, 1947. She was diagnosed with autism in 1950. She is an advocate for people with autism. Because of her autism, Temple did not think in words, she thought in pictures. In the early 1950s, most autistic children were discriminated against, but Grandin’s parents were very supportive of their daughter’s education. In 1970, she graduated with honors and a Bachelor of Arts from Franklin Pierce College. Grandin received a doctorate in animal science in 1989 from the University of Illinois. After receiving her master’s degree in 1975, she created her own company, called Grandin Livestock Handling Systems. She continued learning about animal cruelty through this company. Grandin worked most of her life to help the cruel living conditions of livestock. She worked on ways to prevent putting stress on animals before slaughter (when they are killed to be used for meat). Considering Grandin was autistic, she noticed the similarities in the way animals and autistic people saw the world, which let her help the cause even more. Grandin wrote her first book with the help of Catherine Johnson. After having lots of success with her first book, she had a three hour interview with Johnson. Later that year, a movie was released about her life. In that same year, Grandin was included in TIME's Top 100 Influential People. Grandin also wrote a book with Richard Panek in 2013 called The Autistic Brain: Thinking across the Spectrum, which was about differences found in the brains of those who are autistic. Grandin also believed that vaccines can cause autism. Because Grandin's achievements are so great, many parents of autistic children are inspired by her. Her autism may have been difficult at times, but it has also given her unusual advantages. During her career she has come up with humane conditions for the handling of animals. Grandin is motivated by a wish to improve animal welfare by getting rid of unnecessary stress on domestic animals, particularly before and during slaughter. Grandin is a professor of animal science at Colorado State University. She has focused on animal well-being throughout her career. She has been hired as a consultant to the meat industry (animal slaughtering). Grandin recommends "well-designed upright or rotating restraining pens" to hold cattle in a comfortable position. If this is done, 95 percent or more of the animals will stay calm. She thinks from a cow’s perspective to come up with her ideas. For example, she considers the animal’s sensitivity to light and slippery surfaces. She has said that soft lighting and single-colored walls help calm the animals. Also, she has said grooved floors are best, because cows are scared of slippery floors. "Temple Grandin." Newsmakers, Gale, 2006. Student Resources in Context, link.. Accessed 28 Mar. 2017. This page was last changed on 20 January 2019, at 20:18.